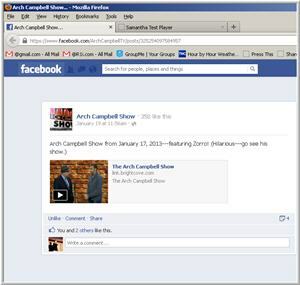 Christian Hunt of the Capital City Showcase recommended me for the Arch Campbell Show. Arch Campbell is well known in the DC area for his longtime history of movie reviews and coverage of the entertainment scene for NBC 4 and now ABC 7. The Arch Campbell Show is a great variety show that airs on NewsChannel 8 through the weekend. Today was my recording of the show. The format is a mix of interview and performance. The recording should air over the weekend. Update 6/22/2013: I’ve uploaded just my segment where I appeared onto Youtube.